As the nation prepares to celebrate Christmas Day, it looks like Santa didn’t come to fill the NFL’s empty stadiums for the league’s Week 16 games. The NFL’s Week 16 began with an admission by the Baltimore Ravens that the mass player protests during the playing of the national anthem when the team was playing on foreign soil in Britain’s Wembley Stadium, has seriously hurt its attendance all year here at home. The Ravens sent a letter to season-ticket holders, sponsors, and suite holders, commenting on the number of empty seats at M&T Bank Stadium and specifically citing the anthem protests as a factor causing the no-shows. Despite last week’s mea culpa, the stadium was still practically empty for Saturday’s game. 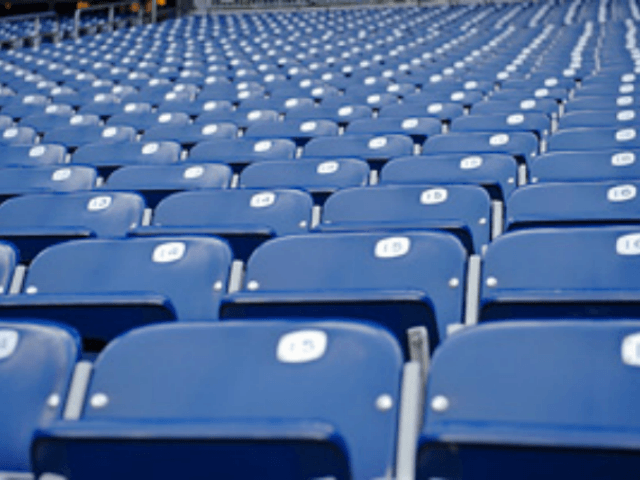 Photos of show a massive number of empty seats at M&T Bank Stadium as the Ravens took on the Indianapolis Colts. The Ravens won the points, but not the fans in a 23-16 final. The tale of empty seats continued as teams kicked off for Sunday’s games, as well. When the Los Angeles Rams traveled to Nissan Stadium to meet the Tennessee Titans, it appeared that fans were less interested in football than the NFL would have hoped. The Titans lost fans and the game in a 27-23 squeaker to the Rams. The Cincinnati Bengals weren’t able to turn out fans at Paul Brown Stadium on the riverfront, either. The Bengals did beat the Detroit Lions, though, 26-17, though. So the day wasn’t a complete loss for the “Who Dey” crowd. As the Miami Dolphins battled the Kansas City Chiefs at Arrowhead Stadium, the Chiefs took the game with a final 29-13. But there were a lot of empty seats presiding over the game. Meanwhile, in a snowy Chicago, the Bears trounced the Cleveland Browns 20 to 3. However, apparently the fans stayed home where it’s warmer. Only about half of Soldier Field’s seats were warmed by a fan this weekend. The Carolina Panthers hosted the Tampa Bay Buccaneers at Bank of America Stadium in Charlotte, and won in a 22-19 final. But fans had other things to do. Video of the game shows a ton of empty blue-backed seats shining through the crowd. When the Denver Broncos arrived at FedEx Field to face the Washington Redskins, fans seemed more interested in tending to Christmas plans back home. Finally, football in New York is still struggling as the Los Angeles Chargers traveled east to MetLife Stadium to face the New York Jets. The Chargers won 14-7, but fans stayed home regardless.